Measure your walls corner to corner (length). Do not subtract for openings: windows, doors, etc. Measure your walls floor to ceiling (height). Do not subtract for openings: windows, doors, etc. Multiply the length by the height to find the square footage. Measure the ceiling and multiply the length by the width. Add the square footage of your walls and ceiling to determine the total square footage. Divide the total square footage by the square footage of a single sheet of drywall (see chart) to determine the number of drywall panels required. Certain types of drywall come in limited sizes. Please keep this in mind when calculating the number of drywall panels required (see below). Certain applications will require a particular type of drywall by code or for better performance. Different types of drywall vary in size. 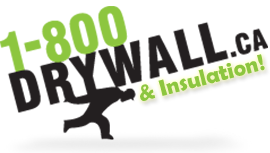 Please keep this in mind when calculating the number of drywall panels required (see above). * Please note: Refer to your Local Building Code for a complete listing of required materials for specific applications. Paper Bead – This product comes in various lengths to suit various ceiling heights. Determine the height of your ceiling and count the number of outside corners. For example, if your ceiling height is 8’ and you have 4 outside corners, you will require 4 8’lengths of paper bead. Or, simply measure the lineal footage of each outside corner and add together to get the overall footage required. Batts are pre-cut panels of insulation and are available in a variety of lengths, widths and R-values. Batt insulation is made to fit within most regular wall framing, which is usually spaced 12", 16", or 24" on center. Measure your walls corner to corner (length). Measure your walls floor to ceiling (height). Multiply the length by the height to find the square footage. Now that you have the square footage, you need to determine the type of insulation to use for your project. Each type of insulation will have a specific square footage per bag. 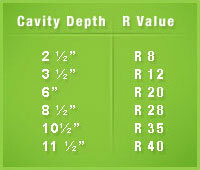 To determine the specific type of insulation you need, first ascertain the cavity depth you will be filling. The cavity depth is the length from the back of the wall to the front of the stud. The vast majority of walls with 2 x 4 studs have a 3 ½” cavity depth—this requires R12 insulation. Measure the space between the studs to determine the size of the insulation you need. Note: If your framing is wood, you must take into account the size of the stud. For example, walls that are framed on a 16” centre will require 15” insulation. If your wall is framed with steel stud, the batt can fit inside the hollow U shape of the steel stud and therefore if the wall is framed on a 16” centre you must use 16” insulation. To put it all together – a 2X6 wall framed with wood studs on 16” centers requires R20X15” insulation, and a 2X6 wall framed with steel studs on 16” centers requires R20X16” insulation. Now that you know the type of insulation you need, select your location and consult the product list to determine the square footage per bag. Divide your overall square footage by the square footage per bag to determine how many bags of insulation you need.